This article serves to briefly educate readers on the appropriate use of Latin words or phrases in legal writing. It addresses two common misconceptions concerning when and how to use a Latin word or phrase. While the following rules and advice are particularly helpful to appellate practitioners, they apply to all legal writing. 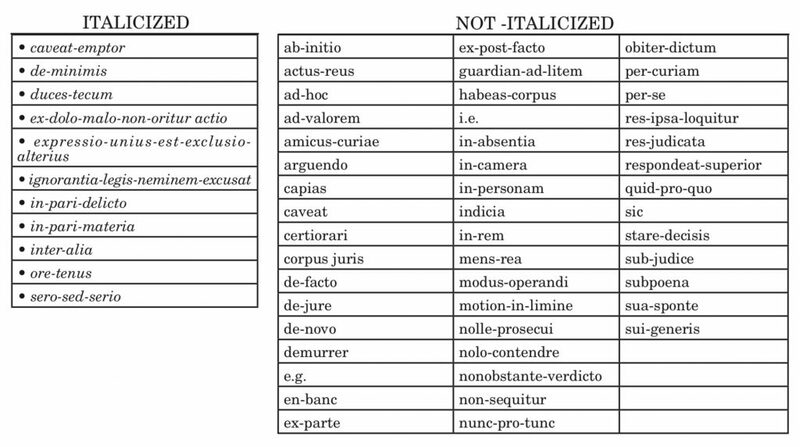 For whatever reason, many lawyers use Latin words or phrases in an attempt to enhance their legal writing, perhaps thinking it will impress their readers. However, it often has the opposite effect. Not only does the use of archaic and uncommon Latin make your writing less clear, but also, you are more likely to make a grammatical mistake when using Latin.1 For those reasons, the use of plain English is generally superior.2 The one exception is for Latin words or phrases that have specialized legal meaning and no adequate English equivalent, such as “voir dire,” “habeas corpus,” and “ex parte.”3 In all other instances, use English instead of Latin. See BRYAN A. GARNER, THE ELEMENTS OF LEGAL STYLE § 7.8, at 193–95 (Oxford University Press, Inc. 2d ed. 2002). See id. ; see also THE REDBOOK: A MANUAL ON LEGAL STYLE § 11, at 215–24 (West Academic Publishing 3d ed. 2013) (stating “the trend today is toward plain language and away from the stuffiness and jargon-laced prose that characterized so much legal writing in the past” and recommending avoiding legalese); ANTONIN SCALIA & BRYAN A. GARNER, MAKING YOUR CASE: THE ART OF PERSUADING JUDGES § 44, at 113–14 (Thompson/West 2008) (recommending banishing needless Latin). because underlining is archaic, puts more strain on the reader’s eyes than italicization, and obliterates the descenders of some letters (such as “g” and “j,” which then look like “o” and “i,” respectively), the use of underlining is not recommended in textual sentences. See REDBOOK, supra note 2, at 79–80 (“Underlining and all-caps styles are just hold-overs from the typewriter era and should be avoided altogether.”); SCALIA & GARNER, supra note 2, § 47, at 122 (“Nobody using a computer in the 21st century should be underlining text. To the extent that The Bluebook suggests otherwise, it should be revised.”); GARNER, supra note 1, § 4.3, at 78 (“Generally, if italic print is available, you should prefer it to underlining.”). BLUEBOOK, supra note 4, R. 7(b), at 83; see also THE CHICAGO MANUAL OF STYLE § 7.53, at 365 (The University of Chicago Press 16th ed. 2010) (“Commonly used Latin words and abbreviations should not be italicized.”). BLUEBOOK, supra note 4, R. 7(b), at 83. See REDBOOK, supra note 2, § 3.3(a)–(b), at 80–81. Although “sic” is not provided as an example in rule 7(b) and is italicized in Black’s Law Dictionary, “sic” should not be italicized when used to indicate a significant mistake in a quotation per Bluebook Rule 5.2(c). See BLUEBOOK, supra note 4, at 77; see also REDBOOK, supra note 2, at 34 (“An interpolated ‘[sic]’ should not be italicized …”). But see CHICAGO MANUAL OF STYLE, supra note 5, at 642 (stating that “sic” is “traditionally set in italics”). Adam M. Hapner is a 2014 graduate of the University of Florida Levin College of Law and currently serves as Law Clerk to the Honorable Patrick M. Hunt of the United States District Court for the Southern District of Florida.